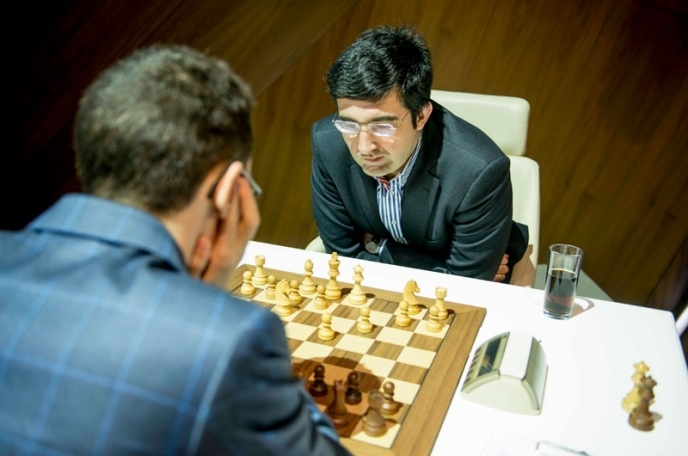 The title of this article was going to be “whatever”, Anish Giri’s description of his feelings after a bloodless draw against Magnus Carlsen, but the spectre of five draws was averted when Vladimir Kramnik misplayed himself into trouble on move 29 against Fabiano Caruana and couldn’t turn back the tide in the prolonged agony that followed. 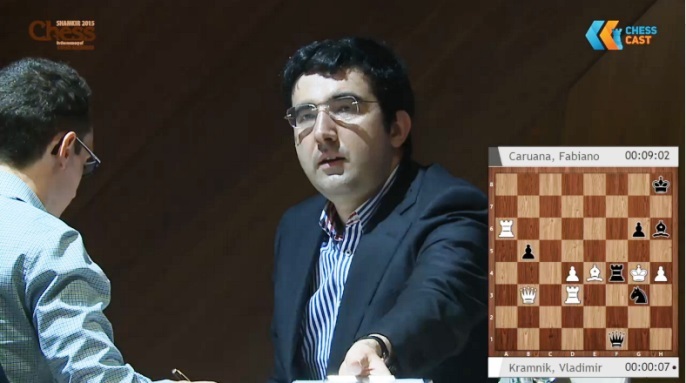 Carlsen now leads by half a point going into the final three rounds, with Kramnik up next. It seems, though, that the players both “knew” there was nothing more than a forced draw on offer, and after 12.Nxe5 Qxe5 13.0-0 the game was essentially over in a handful of moves. All that remained was the unseemly struggle either to reach the required 40 moves or repeat the position. In the end the players did the latter, but only after blitzing all the way to move 37. I think Anish really likes his plus score against me. He’s entitled to that. If he plays a solid opening I have to go all-out or play for a small plus. If he defends well you’re not going to get much with a small plus… My emotion after such a game is, “whatever”. If I was given such an offer as a football player I would ask them to examine their brains. The day’s second draw was more of a fully-fledged affair, but you might still say that the biggest moment of interest was the first move. 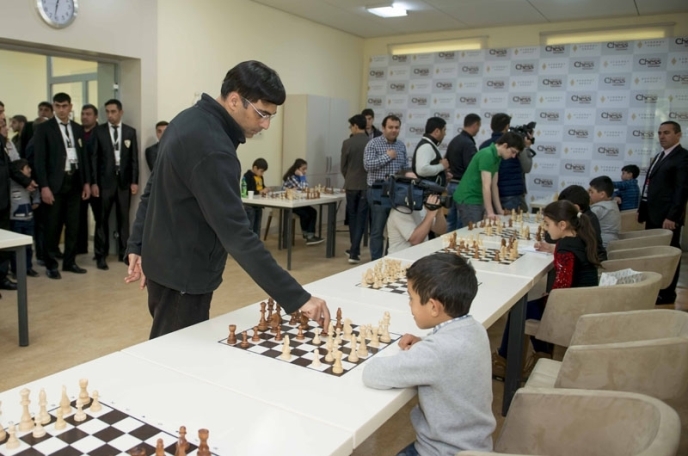 Six years ago Vishy played it against me in a rapid in Baku. I thought it would be nice to surprise him a little bit, although I noticed this wasn’t a very brilliant surprise as I played it against him last. It’s nice to be a little unpredictable, but it didn’t work out in terms of what I wanted to get. Both players agreed the line played was again very solid and the draw by repetition that arose was logical. That just left the topic of the rest day, with Vishy mentioning the simultaneous display he took part in and then that, “I even went and checked out the music a little bit”. When people were confused he clarified – “the party, if you like!”. He also explained that he could hear it from his room, so it was tough to avoid! 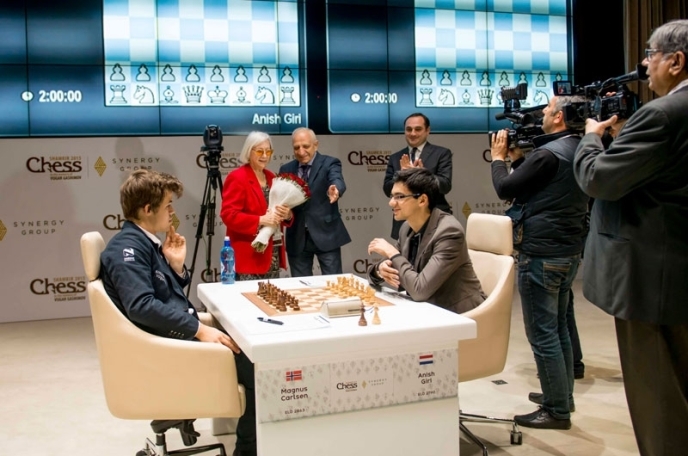 Vishy later added a detail that had been hushed up by those on site – Magnus Carlsen’s team (that also included his father, Fabiano Caruana and Maxime Vachier-Lagrave) had lost 7:1! 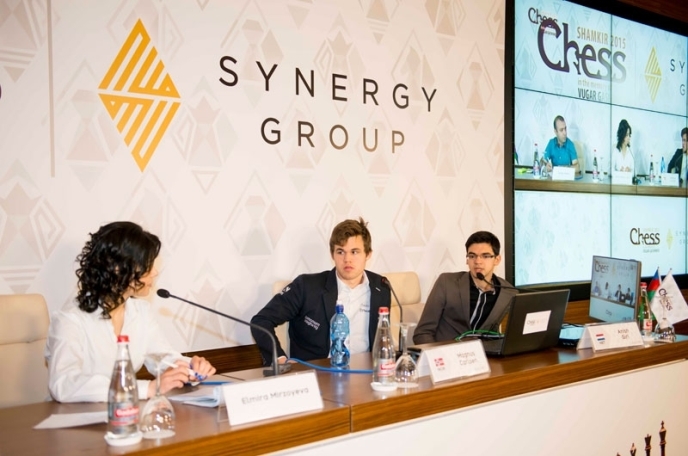 After Magnus Carlsen’s quick draw this game soon developed into a chance for Wesley So to join him in the Shamkir Chess lead. Wesley thought for only 4 minutes 51 seconds here before playing 26.Qd3? 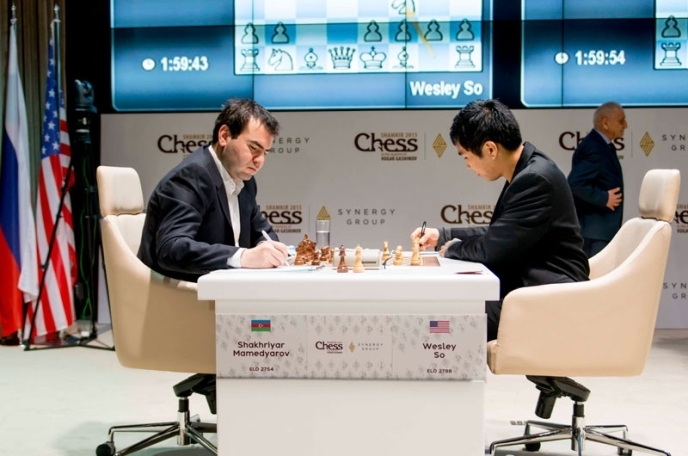 !, when the position soon liquidated into a draw, but it seems this is more evidence of one flaw we learned about from Wesley’s motivational notes in St. Louis and also saw in his loss to Vishy – he has a tendency to move too fast in critical positions. He’d correctly seen here that his intended 26.Rxe7 Nxe7 27.Nxe7 wasn’t so good because of 27…Nd4!, but he could instead have played 26.Rxd8 and e.g. 26…Bxd8 27.Nfd6 Ng5 (Mamedyarov’s suggestion) and then either just 28.Bg2 or the trick 28.Qb3!, when although Black can take the bishop with check he then has to defend against the threat of mate-in-one. Wesley pointed that out in the post-game press conference, so it remained a mystery why he hadn’t at least tried some of these lines. My last two games were not my best results, but I just have to deal with it. There are three games left against very good opponents and I have Black in two of those games, so I’ll have to defend well. He has White in the other game against Magnus Carlsen, so he still very much has it in his own hands to win the tournament. 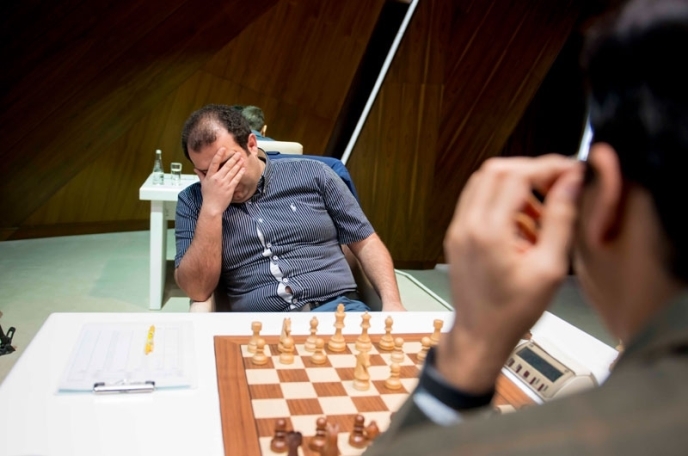 Mamedyarov, meanwhile, revealed that he’d spent the night before the game playing blitz (and even bullet) until 4am, with Maxime Vachier-Lagrave one of his opponents! No photo is needed for this clash when we have this tweet! I thought it was just a draw by force by b5, which was a tad optimistic, in hindsight. I was just lucky that my oversight was not of such big consequences. At some stages I was making a bit of progress but around the time control we seemed to come to a bit of an impasse. It seems to be impossible to keep the major pieces on in any sensible way. Black is too active. It becomes quite practical for Black because he’s just offering the exchange all the time and I’m not sure what I’m doing. The game lasted to move 59, but by then it was just a typical opposite-coloured bishop ending where an extra pawn made no difference. It was quite a busy free day, actually! I got a very nice edge without any kind of risk, so it would have been hard to choose anything better! It wasn’t heading anywhere close to a win and I was expecting to fight for my life in this game after 20 moves. But sometimes things happen this way.